For reference the statistics we’re sharing today are based on VDI via VMware Horizon View 6, these figures are averages across at least three independent tests. All details of the tests that exported these results are covered below. • Statistic sample period: 5 seconds. With that out of the way, lets jump right in! The number of IO’s per second is crucially important when dealing with storage; many, many small IO’s sent to sparse locations on disk are a killer to storage technologies, only made worse by certain file systems. 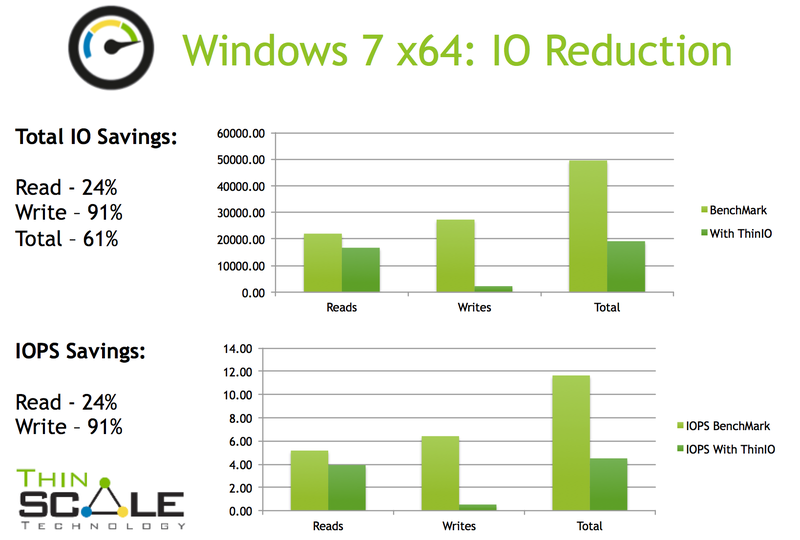 Even with just 350 MB of ram as a cache, we achieve phenomenal IO reduction. But IO’s are just one part of the puzzle, what about the size of the data requests being sent to the storage? A true solution to take the pressure off the SAN, improve user performance, and increase storage density needs to tackle both the IO and the throughput problem. As you can see above, with just 350mb we’re very good at it! So rounded figures are fine so long as the data is trustworthy, but here’s a real preview laid bare for your analysis. 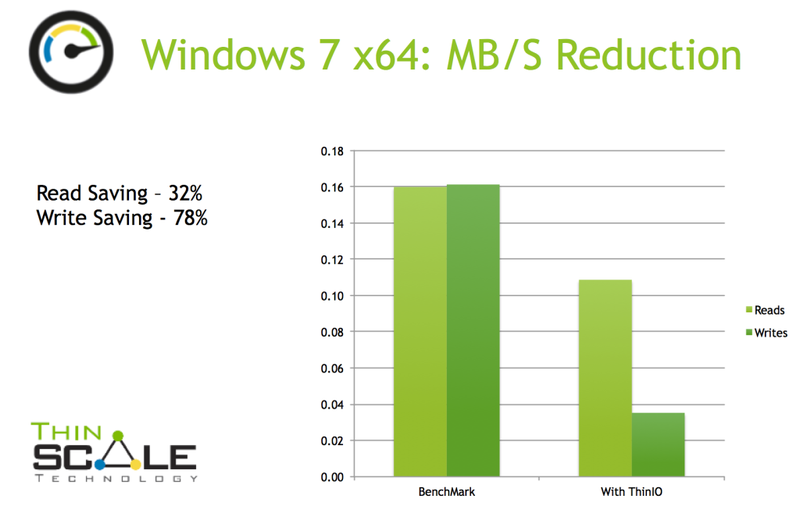 As you can imagine, we’re extremely proud of what we can achieve with as little as 350mb per desktop. The beauty of our approach is simplicity, your users can see this benefit not in a matter of weeks, days or even hours. ThinIO can be up and running in minutes, delivering reduced login times, storage acceleration and providing a far deeper density on your current storage. So there you have it, we’ll be adding additional blog posts in the coming days looking at Remote Desktop Services / XenApp, intelligent cache management built in and our Read Ahead technology, so check back. In the mean time, if you would like a chance to test ThinIO pre-release, find access to the public beta below. Thank you for your time and happy testing! * Eight-hour figures and complete statistics are also available, we have nothing to hide and we’d encourage you to get in touch with the ThinScale team and we’ll share them with you. In the release notes for the public BETA, you state that only VDI workloads are supported. My use case would be on a Windows 2012 R2 iSCSI target server to provide block-level RAM caching. Will you be providing support for that use case in the RTM version? What role do you have on these servers? None yet as the server hasn’t been deployed yet. Would likely be a dedicated iSCSI target and that’s it. Hi Alan, hate to hit you with the consultants answer but ‘it depends’.